PC Bingham had other concerns including: the inefficiency of the Central Office (Headquarters) Detective Bureau, the few Precinct Detectives who were under control of the precinct Captains, and the very rank structure of the department itself. PC Bingham had a military background (he was a General) and wanted a military rank structure in the department. To accomplish what he wanted, a change to the NYC Charter would be required, and that meant that legislation by NYS was required. The “system” fought the legislation as it threatened the system of graft that was permitted by the politically-backed inspectors who collected graft and ordered their men not to take enforcement action against certain bars, brothels and gambling houses. Proponents of the bill included several citizens groups including the “Citizen’s Police Committee of the New York Bureau of City Betterment for the Conduct of Research.” As providence would have it, the author of the report was Arthur Woods, who as a result of the Bingham Bill, would, pursuant to G.O. 43, dated July 24, 1907, be appointed Fourth Deputy Commissioner in charge of the newly formed Detective Bureau. Once the bill was signed by the Governor of New York State, PC Bingham promulgated a series of three General Orders based on the bill. Ranks were created and abolished. Some officers were promoted, others demoted. Men in the upper echelon of the department, who had received the order, reported to headquarters to learn their fate. Few men were spared. Those that “took a hit” were eight Inspectors and “unnumbered” Detective Sergeants in the Central Office’s Detective Bureau, who had recently been granted the rank of Lieutenant under a new law. Inspectors, who supervised Captains in more than one adjoined precinct, were reduced to the rank of Captain and assigned as Commanding Officers of a single precinct. The Lieutenants, who were previously Detective Sergeants, were removed from the centralized Detective Bureau and cast about to precincts throughout the city. The Police Inspectors’ Association of the City of New York feared the loss of the permanency of the rank. The Inspectors who were demoted and transferred were a veritable “Who’s Who” of the turn of the century department. As remains the practice to this day, the transfers were punitive in that they sent the transferee from one part of the city (generally located near their residence) to a precinct far away from their residence. Remember that public transportation amounted to the limited subway lines (the subway first opened in 1904), horse-drawn and mechanized omnibuses, ferries, and various other means powered by the horses or engines. The only bridge crossing the East River was the New York and Brooklyn Bridge. 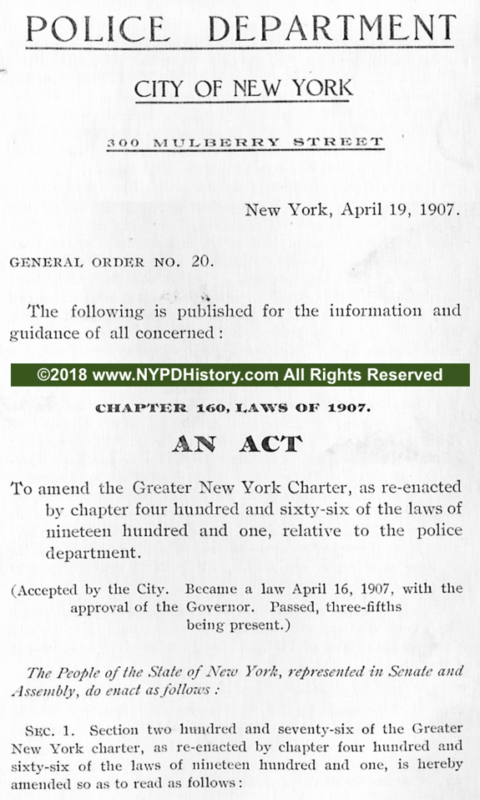 General Order 20 – Entitled An Amendment to the Greater New York Charter, as re-enacted by Chapter 466 of the Laws of 1901, relative to the NYPD. Prior to the passage of the Bingham Bill, the rank of Inspector was a product of civil service. Acts of meritorious service performed by a candidate for promotion were to be considered by the civil service commission by way of points added to the candidates examination score. 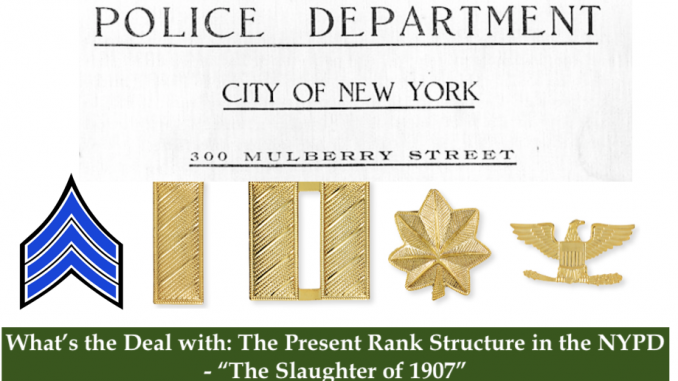 That Sergeants were to be promoted from patrolmen and only demoted to Patrolman “after due trial upon charges;” that Lieutenants were to be selected from sergeants with two years in title and may be similarly reduced to previous rank; and that Captains were to be selected from lieutenants who had three years in title. This part of the bill was viewed as a blow to the “system” which took advantage of the appointment of a man to the rank of Inspector by holding the recipient hostage to those politicians that placed him in the rank. With the detail to the rank of Inspector now at the discretion of the PC, the influence of politically appointed Inspectors was broken. That the PC “shall organize and maintain a bureau for detective purposes to be known as the detective bureau;” that the PC may detail, and revoke the detail of, any number of men to the bureau as he may deem necessary. Prior to the passage of the Bingham Bill, the rank of Detective was a product of civil service. 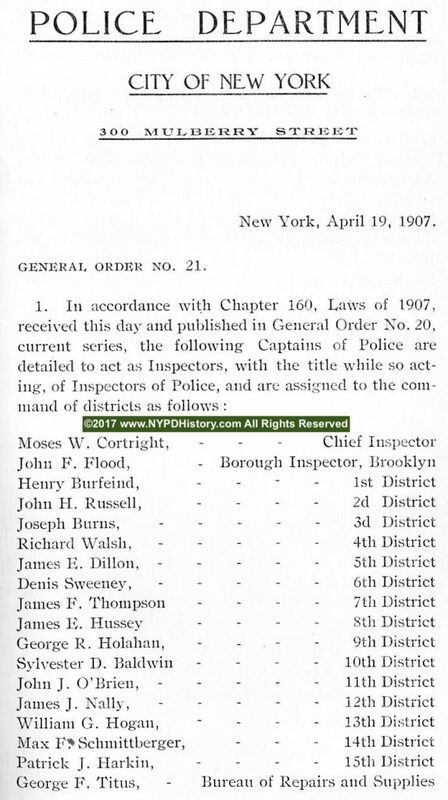 That the Commanding Officer of the Detective Bureau receive the salary of a Captain; that 150 men be detailed to the new grade of “First Grade Detective” with a salary equal to that of Lieutenant; that the bureau operate out of headquarters; and that a branch office be established in Brooklyn, with others established when deemed necessary elsewhere. By September 1908, the hierarchy of detailed Captains included Chief Inspector, Borough Inspector, District Inspector, and Inspector. It was necessary for McCafferty to be promoted to Captain before he could be made Acting Inspector and continue to serve as Commanding Officer of the new Detective Bureau. The order then remanded to uniformed duty twenty-seven Lieutenants who were previously assigned to Detective work as well as six Patrolmen. 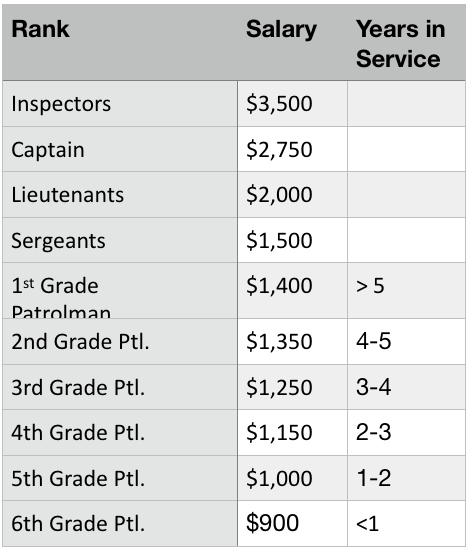 The order then detailed four Lieutenants, one Sergeant, and eleven Patrolmen from uniformed patrol to the Detective Bureau. The new Lieutenants wore a single gold gilt bar on their sleeve and collar. In May 1907, new shields for Lieutenants and Detectives were issued. The shields for Lieutenants had a large panel bearing the shield number of the officer. Richard E. Enright, President of the LBA, fought to have the numerals removed and won. The resulting starburst design, absent any numerals, remains to this day. The Detectives’ shield changed slightly over time, but the original style remains largely unchanged . 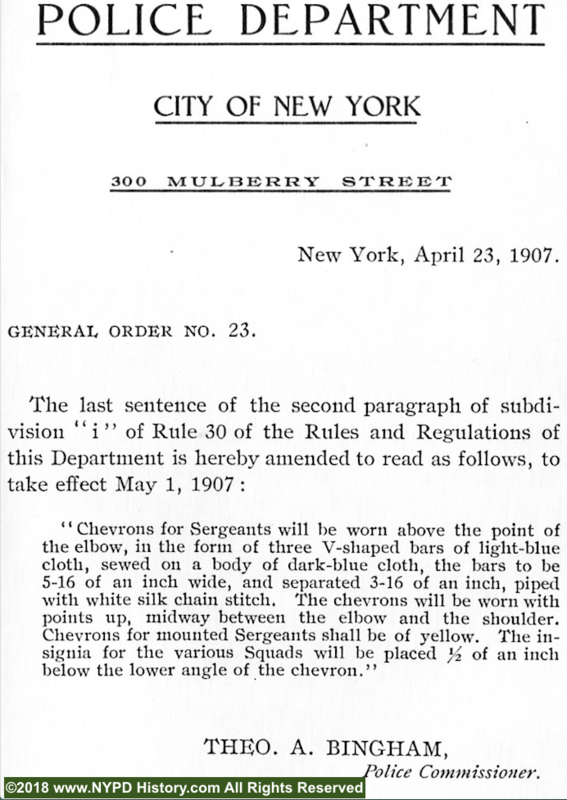 Pursuant to General Order 23, issued on April 23, 1907, the new Sergeants wore three chevrons on their sleeve. New Shields for Sergeants were ordered. The style remains largely unchanged. 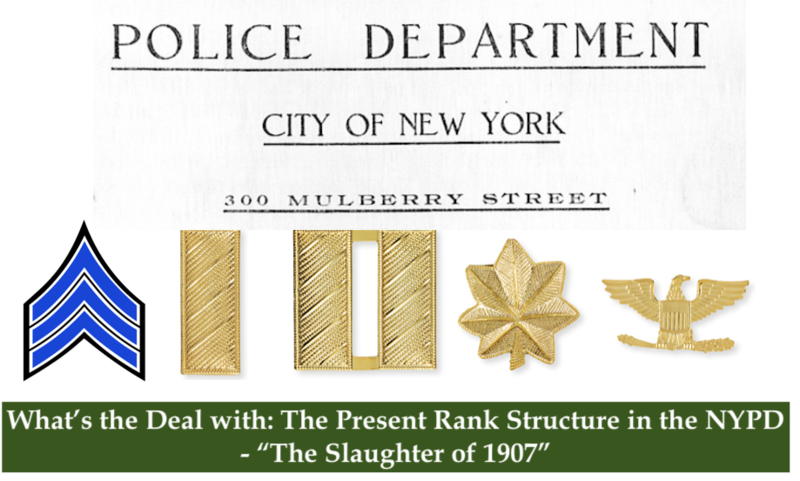 What’s the Deal with: The Present Rank Structure in the NYPD? Prior to his appointment, PC Bingham had been an outside observer of the department. After his appointment, he concluded that the PC had little or no control over the politically-appointed Inspectors, whose titles were permanent, and that the longstanding systemic graft and corruption could not be broken unless the PC could select, detail and demote Inspectors. PC Bingham also determined that the Central Office Detective Bureau was inefficient as were, largely, the few Precinct Detectives. 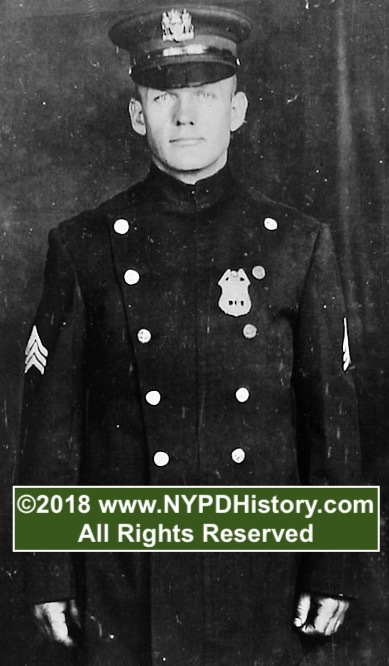 By abolishing the Bureau and re-establishing a Detective Bureau, PC Bingham “re-booted” the Bureau and selected capable men who served as detailed Patrolmen. Additionally, he created the title of First Grade Detective. One by one, the long-serving Inspectors would retire and more detailed Captains to that rank replaced them. It appeared that PC Bingham had found the “Achilles Heal” of the system and had broken it. 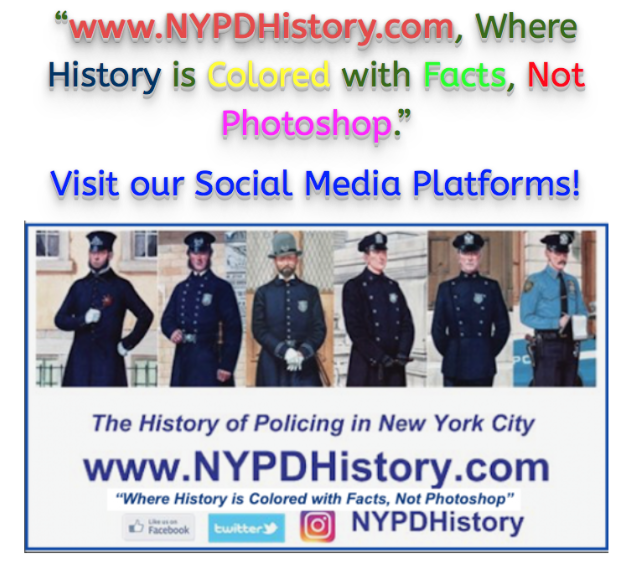 The Author has selected relevant excerpts from the 1908 Rules & Regulations of the Police Department of the City of New York, issued on September 24, 1908 which are relevant to the aforementioned article. For those interested in learning how the changes made by the Bingham Bill were reflected in the Rules & Regs. Click Here -> 1908 Rules & Regs <- A .pdf format document which will open in another browser window. As is the case will all of his posts, the Author welcomes input, corrections, suggested clarifications, and constructive criticism.